It's Saturday morning, and after a few brilliantly sunny, frosty days, the weather has turned what we call 'murky' - which means dull and grey, with a pervasive dampness in the air. It may well be mid-morning, but in the murkiness it feels much earlier! Our mornings - even on sunny days - have definitely been getting darker and colder, and on those days when the sun struggles to rise and greet the day with a smile, a warm bed is especially alluring. Even though the heating has come on, I still snuggle contentedly in my drowsy duvet cocoon for as long as possible. So when I saw this picture on Facebook the other day I chuckled knowingly. Yes, this is me; a drowsy mass of inconsistencies and extremes. I'm all for adventure, high jinks and joining the revolution, but not on a Saturday morning (or indeed too early any morning!) 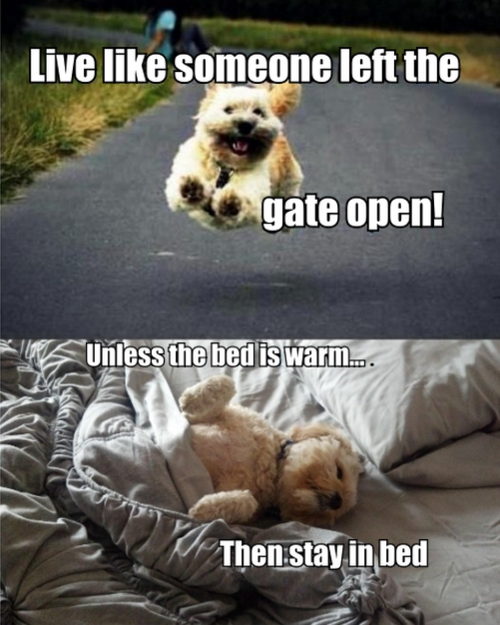 - especially if the morning is dark and chilly and the bed is warm!